The Midwest of the United States has been hit with some brutal weather and extreme temperatures lately. Negative temperatures have become a nightly occurrence and the daytime temperatures have rarely seen the double digits. With icy roads and snowy conditions, humans need to take extra care and caution when they’re leaving their houses because danger could be lurking around any corner. And for pets and animals? The danger is even worse. 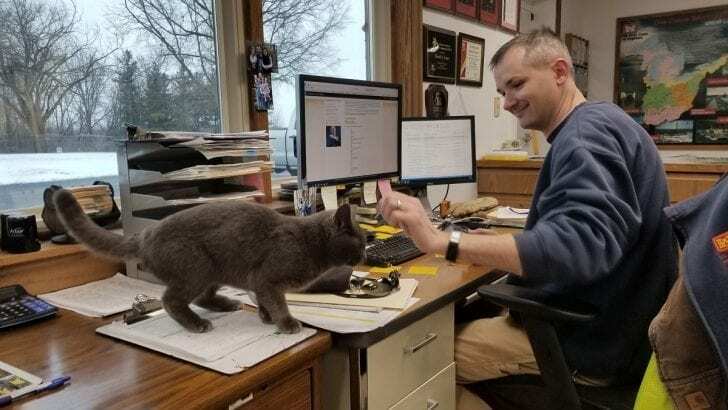 A cat in northeast Indiana had the scare of a lifetime when he wandered outside on this freezing winter day in January 2019. The first couple of weeks in Indiana were not the easiest to endure. Temperatures had a range of 40-degree highs to a numbing 5-degree low. The cold temps were nearly unbearable – and a cat named Mr. Vanjie nearly lost his life while venturing out in them. The Greving-Stutvoet family adopted Mr. Vanjie approximately one year ago. He randomly wandered up to their doorstep and they fell in love with him immediately. 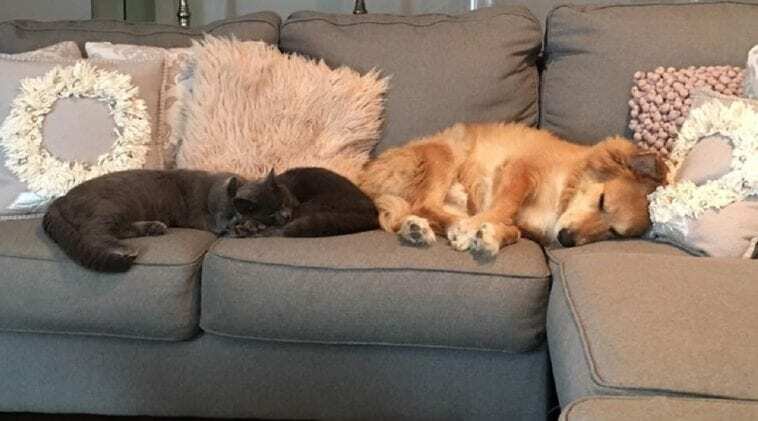 Since then, he couldn’t have been happier to become their family cat – and although the family likes to keep him indoors, he prefers to come and go as he pleases. So, leaving the house to go explore was not something out of the ordinary. In mid-January, Mr.Vanjie went outside to do a bit of exploring – however, this time, he never returned. The family started to become worried and they spent the next two weeks searching for their beloved cat. Not only had Mr. Vanjie never been missing for this long – but the temperatures were far too cold for him to be outside for long. The Greving-Stutvoets feared the worst for Mr. Vanjie. Soon, a fisherman in the J.E. Roush Lake Arrowhead North Picnic Area noticed something very strange as he was fishing for his daily catch. 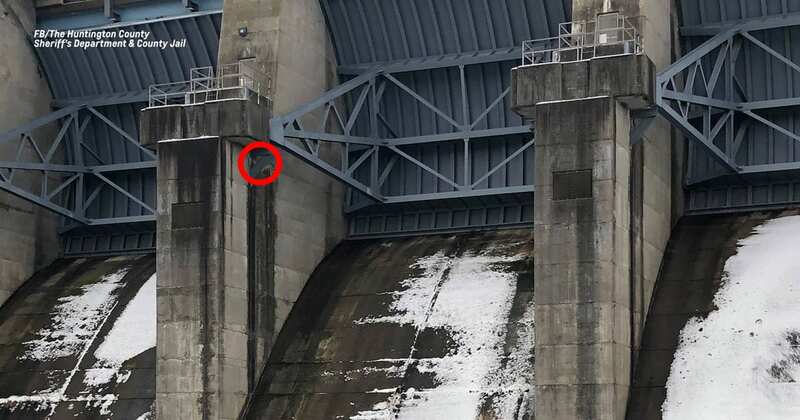 A grey cat was stuck halfway down the concrete wall of a spillway. He couldn’t believe his eyes because it was a very odd spot for the cat to be in. The man immediately called the authorities and it was a call unlike any they’d received before. The poor cat was stuck in one of the worst areas they could possibly be – they believe he was trying to hide from passing cars. Freezing water was an imminent threat to the terrified little guy. The Huntington County Sheriff’s Department knew they’d have to get creative when rescuing him and re-told the story on Facebook. 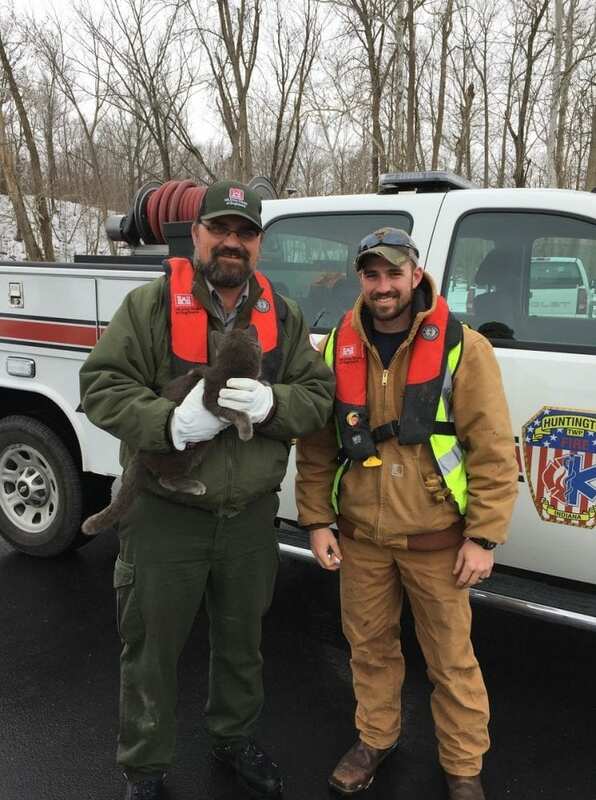 Thankfully, the U.S. Army Corps of Engineers Conservation department was nearby to assist in the rescue. Two of their members, Ryan Martin and Jared Perrott soon arrived on the scene. Although it wasn’t ideal, they knew that their best chance of a rescue was going to be by boat. An hour passed by before they received permission to turn off the water at the Roush dam so they could launch the boat. They had no idea how the cat would react, but they knew they had to make an attempt to approach him. Video of the rescue below. When the boat eased its way up to the edge of the spillway, the cat surprised them all by willingly sliding down toward them. The cat emerged from his hiding spot and slid down the entire length of the concrete wall. 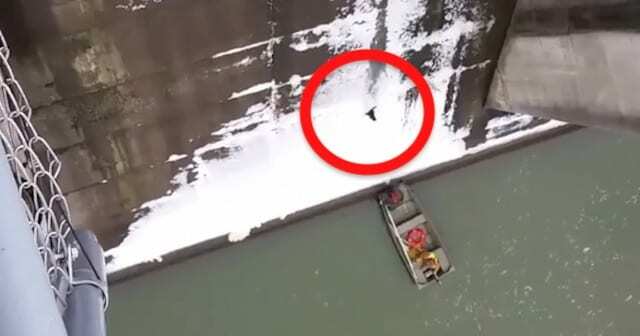 The rescuers were waiting at the bottom to catch the terrified cat before he hit the frigid and deathly waters. Heidi Greving-Stutvoet was watching the news and saw the entire rescue unfold – she couldn’t believe it, but it was Mr. Vanjie! She and her family immediately contacted authorities and rushed to go pick up their pet. Mr. Vanjie is now happily at home after surviving the slippery ordeal and we hope he decides to stay warm and indoors for a while. Watch the harrowing rescue in the video below.